At Barry John Acting Studio, 301, Nanak Chambers, Opposite Fun Republic, New Link Road, Andheri West, Mumbai 400 053. This is an open event but with limited seating. Mahmood Farooqui is a Rhodes Scholar, historian, filmmaker, and a Dastango. Mahmood has been a researcher as well as a practitioner and his various interests in cinema, theatre, literary Urdu and Indian history, are brought together by this form. Among his many accomplishments are co-directing the feature Peepli Live, penning the book Besieged: Voices from Delhi 1857, and reviving the lost art form of Urdu storytelling, Dastangoi. 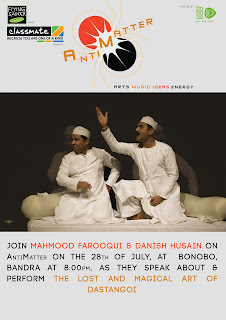 Danish Husain is a poet, actor, theatre director, and a Dastango. He runs his own theatre and film company, The Hoshruba Repertory, and actively collaborates with Mahmood Farooqui in reviving the art form of Dastangoi. Today the conversation is about the revival of an ancient form of storytelling – Dastangoi, which has been honed for centuries by practitioners. It can be used to perform traditional stories and also to tell contemporary stories. Dastangoi extends the boundaries of poetic recitation and takes it to the level of performance and as a form of storytelling extends to drama through the device of using two actors. 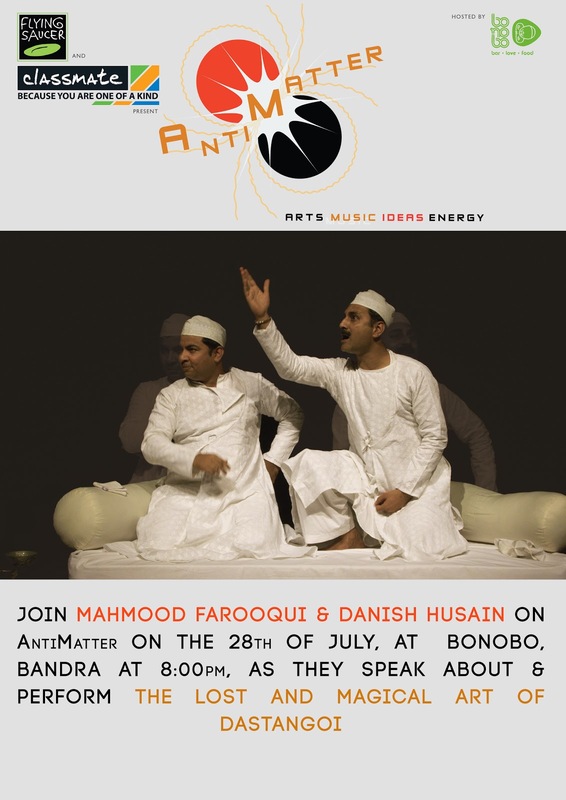 AntiMatter on Saturday, July 28, 2012 at 8pm at Bonobo, Bandra, Mumbai. Entry Free.